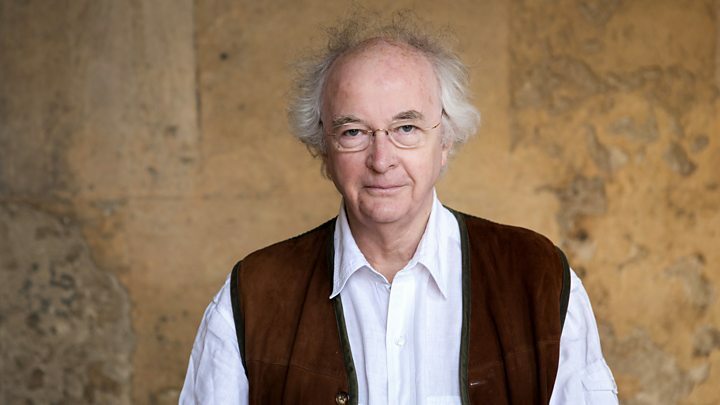 Media caption17 years after His Dark Materials, Philip Pullman reads from its new "equel"
Philip Pullman's return to the world he created more than 20 years ago for His Dark Materials has been greeted with eager delight by most critics. The author's new book, La Belle Sauvage, arrives 17 years after the His Dark Materials trilogy ended. It is worth the wait, according to the Washington Post, while the Daily Telegraph gave it a five-star review. The New York Times praised a "stunning achievement" but had some reservations, saying the novel "sometimes lags". La Belle Sauvage is set a decade before Northern Lights (titled Golden Compass in the US), the first book in the His Dark Materials trilogy, which was published in 1995. The trilogy's heroine, Lyra, is a baby in the new book - she is cared for by nuns before being protected by Malcolm, 11, who lives at a nearby pub. In Pullman's alternate reality, Malcolm is drawn into an underground resistance movement trying to fight a fascist religious organisation that rules over an autocratic state. The book takes its title from the name of the pub's canoe - which Malcolm and Lyra use to escape a flood, chased by a terrifying villain, Bonneville. La Belle Sauvage is the first instalment in a new trilogy, The Book of Dust. Pullman has said the next two instalments will be set after His Dark Materials. The Washington Post's Elizabeth Hand said the past 17 years disappeared "in a blink as one reads the enthralling, enchanting first instalment". "The first half of The Book of Dust reads like a thriller," she wrote. "The story becomes darker, deeper and even more engrossing when a cataclysmic flood overtakes southern England." Bonneville was "one of the most frightening villains in contemporary literature", and the new book felt "more earthbound - in the best way - than the earlier trilogy". Hand added: "Too few things in our own world are worth a 17-year-wait: The Book of Dust is one of them." Slate's Katy Waldman was even more enthusiastic, predicting people would love the book "with the same helpless vehemence that stole over them when The Golden Compass came out in the mid-90s, or even when they first met their partners or held their newborn children". She wrote: "I absorbed La Belle Sauvage in intense, immoderate bouts of pleasure, horror, pain, and love. "Part of this heightened experience relates to the electric emotional content that Pullman so deftly handles; part of it is his sure command of centuries of resonant English poetry and philosophy." The Telegraph's Sam Leith found a "slight question mark over who the book is for" because "the pretty childish and the very adult share space in its pages". Leith added: "In the foreground is a straightforward adventure story - even a slightly trad one: Five Get Into Trouble In A Theocracy sort of thing, or perhaps Dust William - of great pace and interest. "Yet its Swallows and Amazons qualities, as it goes on, rub against something altogether darker and more mysterious." In The New York Times, Sarah Lyall said her view the new book did not quite live up to the original trilogy may have been coloured by her "impossibly high expectations". And she hoped Pullman was "biding his time, laying down the groundwork for what is yet to come". She wrote: "It's a stunning achievement, the universe Pullman has created and continues to build on. All that remains is to sit tight and wait for the next instalment."